Did you know that between 100 million and 1 billion birds are killed by collisions with windows each year? Window collisions is one of the three top three causes for bird decline among North American birds and may be the number one quantifiable cause (the other two are habitat loss and cat predation). Researchers estimate that between one and ten birds are killed EACH year at EVERY home in the US. Combined with commercial building kills, between 100 million and a billion birds perish this way each year. Birds don't recognize glass the way we do. They see the reflection of the sky and trees and it seems like a continuation of the sky to them. Birds are also attracted to inside vegetation, not realizing that it is behind glass. Do not think that a bird has never hit your window if you have not seen their bodies in your yard. Many birds fly away, but are gravely injured and later die from the blunt force trauma of colliding with the glass. A variation of this experience happens with larger commercial buildings. 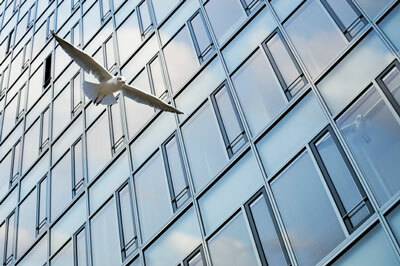 With both the use of glass in general, and the use of reflective glass as the main type, growing in popularity, many glass-facaded commercial buildings have become significant sources of bird mortality. This problem is magnified when trees are planted near the building. Migrating birds see the reflection as reality, and seeking the sky or tree the reflection presents, unwittingly fly into the glass with lethal force. Unfortunately, it is not unusual for dozens of birds to perish at problematic buildings as they navigate on migration through urban centers like New York, Boston, Chicago, Toronto and San Francisco. Long Island buildings pose a problem too. 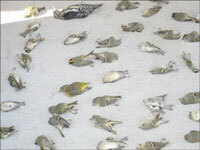 Fifty two golden-crowned kinglets, several warbler species and yellow-bellied sapsuckers died in one day flying into an all-glass building situated in Great Neck as they migrated south this past October. All-glass buildings at the Jericho and Huntington Quadrangles are also known to kill birds. 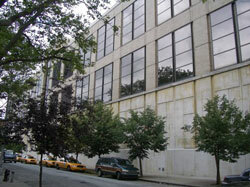 A small group of dead birds found one morning at an office building in Great Neck in spring 2010. Fortunately, there is a technological answer to the problem. Unlike humans, birds can see ultraviolet light. Window and window film manufacturers are taking advantage of this ability by making windows and easily applied window films that reflect UV light. Windows so equipped, instead of deceiving birds, inform them that the windows are solid objects that should be avoided. And since we cannot see UV light these solutions pose no aesthetic concern. For more ways that you can help birds, see below. Because collisions are caused by birds attempting to fly through glass, or because they see the reflections of the sky and trees and are unable to recognize the glass as a solid object, be sure to break up or eliminate their view by placing decals on your windows, ideally one-quarter-inch wide, white, vertical stripes spaced four inches apart, or one-eighth-inch, black, horizontal stripes spaced one inch apart. If you feed birds in your yard, move the feeders and bird baths to within three feet of your window. The birds cannot gain enough momentum at this close range and you greatly decrease the chance that they will get hurt. If this is not possible, move them at least thirty feet away. Move inside plants away from windows so that birds do not mistake them for outdoor habitat. 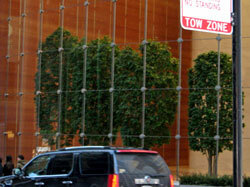 Consider using screens, bars or film on your window to eliminate reflections. 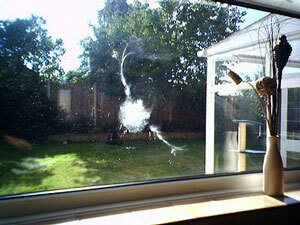 If you can, purchase bird safe glass to have installed. If you are landscaping your yard, try to place trees and shrubs away from your windows in order to prevent reflections in the glass that look like a continuation of your yard. American Bird Conservancy Bird Friendly Building Designs: The American Bird Conservancy has produced the book Bird-Friendly Building Design to assist developers, architects,and building owners working with LEED Pilot Credit #55 – Reducing Bird Collisions; regulators and builders researching the application of voluntary guidelines or mandatory standards for buildings;or anyone simply looking for detailed information on the collisions issue and designing structures that minimize bird deaths.